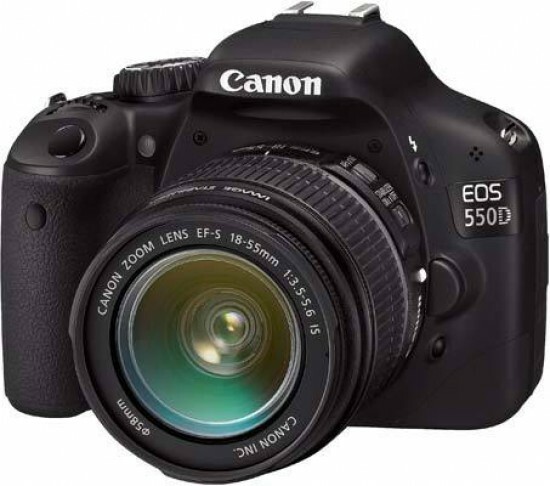 Reviews of the Canon EOS 550D from around the web. Canon's new mid-range flagship builds on the popular EOS500D by squeezing in an 18Mp CMOS sensor and a top sensitivity of ISO6,400, improved movie capabilities and a higher resolution screen amongst other improvements into the same-sized body. Here we'll take a look at whether it's worth the current asking price of £749 for the body only, or £899 with the 18-55mm IS F/3.5-5-6 lens. Canon's EOS 550D – or Rebel T2i as it's known in North America – is the company's latest upper entry-level DSLR. Announced in February 2010, it's numerically the successor to the EOS 500D / T1i, although the older model is expected to remain on-sale at a lower price point throughout 2010. Canon's response has been to expand its range of consumer cameras especially in the mid-range area, launching the 15-megapixel EOS 500D towards the end of last year, and now following it up with a new mid-range model, the EOS 550D. With a newly designed 18.1 megapixel CMOS sensor, 1080p HD video recording and the sharpest monitor of any current DSLR it has an impressive specification, handily trumping the D5000 and Alpha A550 in all the crucial areas except price. The Nikon D5000 is currently selling for around £500 body-only, while the Sony A550 is around £550. The EOS 550D is available for just under £700 body only, or around £750 with the kit 18-55mm f/3.5-5.6 EF-S image-stabilised lens.